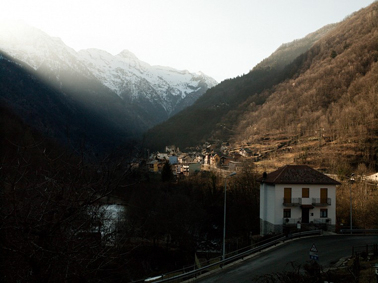 Every winter between 11 November and 2 February the sun fails to rise above the flanks of the Alps, leaving the North Italian village of Viganella completely in shadow. Situated in a narrow valley at the end of an 80-kilometer road it is subject to an exodus of its population. Only the center of the village is inhabited, merely by elderly people. Residents of Viganella and the neighboring villages who face the same problem blame the lack of sunlight in winter. The mayor raised funds for a large computer-operated mirror, to be built 500 meters up the slope high above the village. For seven hours a day it reflects the sunlight to the central square of the village. It is also found useful to defrost icy roads. And as a gift it illuminated the house of a lady celebrating her 90th birthday. In the mountain regions old laws have always reigned relations between man and nature. Working the hardest rocks or climbing the highest heights.